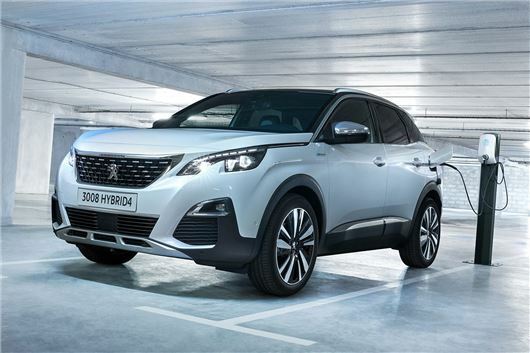 Peugeot is adding plug-in petrol hybrid engines to the 3008, 508 and 508 SW. The new Peugeot 508 (and 508 SW estate) uses a Puretech 180PS petrol engine with an 80kW electric motor, to produce a combined 225PS. Under new WLTP fuel economy tests, it'll officially emit 49g/km - although MPG figures are yet to be confirmed. The 3008 crossover, meanwhile, is equipped with the Hybrid4 system, which combines a 200PS petrol engine with two electric motors (one at the front and one at the rear). This means it produces a total of 300PS and will cover 0-62mph in 6.5 seconds. The 13.2kWh battery gives it an electric-only range of 30 miles under WLTP tests - meaning you'll be able to cover local journeys under electric power alone, if you can charge at home. Both the 508 and 3008 can be charged in less than two hours using a 6.6kW wallbox, with coloured lights around the charging socket will inform you of the battery's charge status. The PureTech engine uses Peugeot's latest eight-speed automatic transmission. The Hybrid4 engine is only available in GT trim, complete with full Mistral black leather with aged grey oak trim. A few months after its launch, the Hybrid4 version will be joined in the 3008 range by a Hybrid version of 225PS. Drivers can use the e-Save mode to conserve energy for when they need it most, while the i-Booster conserves power as the car brakes or decelerates, pumping it back into the battery. Drivers can also flick between various driving modes, including 100 per cent electric mode, four-wheel-drive mode (with the Hybrid4), sport mode, comfort mode or hybrid mode. Peugeot's i-Cockpit infotainment system will provide access to the new hybrid functions as well as information such as electricity consumption and the available electrical distance. Hybrid and Hybrid4 versions of the 3008, 508 and 508 SW models will go on sale in autumn 2019. Prices are yet to be revealed.